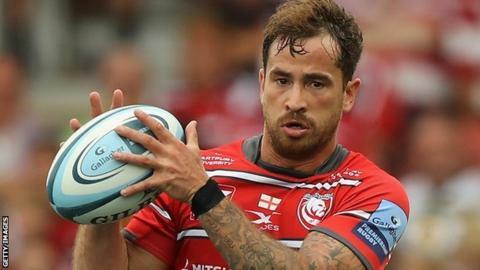 Fly-half Danny Cipriani will be judged solely on his performances on the pitch for Gloucester, says England head coach Eddie Jones. Cipriani, 30, admitted common assault and avoiding arrest last month and was reprimanded by his club and the Rugby Football Union (RFU). Jones said the issue has been "dealt with" and now Cipriani is contention for the autumn internationals. "I went down there on Monday and had a chat to him," Jones told BBC Sport. "We will judge him on what he does on the pitch." England face South Africa, New Zealand, Japan and Australia at Twickenham between 3 and 24 November. Cipriani was fined £2,000 by both Jersey magistrates and his Premiership club after an incident in a nightclub. He started England's most recent Test - a 25-10 win over South Africa in Cape Town in June - and was man of the match on his Gloucester debut against Northampton last weekend. But his arrest in Jersey was the latest in a line of off-field indiscretions. "You have got to find out what really happened. You have to find out the facts," Jones said. "We spoke to Cipriani, we spoke to the club. We feel it's bean dealt with. "It was a situation you wouldn't like to have and you wouldn't like to have again. Danny understands that." Jones said winger Chris Ashton is "still in the mix" for selection despite currently serving a seven-week ban for a dangerous tackle. Sale's Ashton is unlikely to play before Jones names his squad in mid-October. "It's tough, but he's certainly not out of the picture," Jones said. "We would rather see him playing than on the sidelines, but he's got a chance." "He came into the August camp with a great attitude. "One of our staff members went up to Sale and worked with him the last few days." The RFU is close to completing a deal to appoint former All Blacks coach John Mitchell as defence coach. Jones said the governing body is "getting closer" to finalising a deal for the New Zealander, who is head coach of the Bulls in South Africa. He also confirmed he spoke to former England defence coach Andy Farrell, who is currently with Ireland. "We are always looking at good people, but he is in contract with Ireland and out of our reach," Jones said. Jones rejected suggestions that his high turnover of staff is unsettling with only a year to go until the start of the World Cup in Japan, and said England are "in a great position". "There are exceptions when you lose a staff [member] because of family reasons or because they are not a cultural fit or they don't like working with me or they don't like working with some of the other staff," he added. "That always happens. We are super-organised and we have improved the staff."